You might have seen commercials for Destiny, the upcoming sci-fi shooter that will be out for multiple platforms next week. You might have noticed that all of these commercials talk about the PlayStation version of the game. This is because Activision and Sony are getting all buddy-buddy on the marketing campaign, with the folks behind Destiny offering all sorts of "exclusive" content for PlayStation owners. Microsoft's response? This cheeky series of advertisements, first posted on the Xbox UK Twitter and Facebook accounts, that claims they're making a Destiny-themed fragrance. They're not. The website, which is linked in UK magazine ads, just takes you to a British pre-order page for the game on Xbox. But what's interesting here is that dig at Activision. "Thing is, we didn't have permission to run adverts for the game. So we didn't." Strange, right? Assuming this is true—and why would they write something like that if it wasn't?—it's fun to see a company like Microsoft calling Activision out for partnering with Sony on what's surely going to be a huge game all around. I love it when corporations fight one another. Destiny comes out on Tuesday. 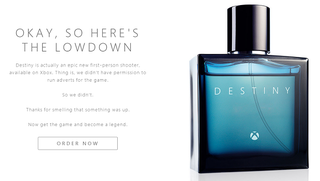 The Destiny Fragrance does not. UPDATE (4:14pm): And now message on the website just says "Hi. There are some great Xbox One offers available at the moment. Please check with retailers for more information." Guess Microsoft got yelled at! We've still got the original image above.